James, C L, 10th May 1918, 15th Bn. Welsh Regiment, Second Lieutenant, MARTINSART BRITISH CEMETERY, I. E. 4. Local Memorial - Pontnewydd War Memorial and All Saints church, Ponthir. Jarrett, George Maxwell, 25, 14th August 1917, 1st/2nd Bn. 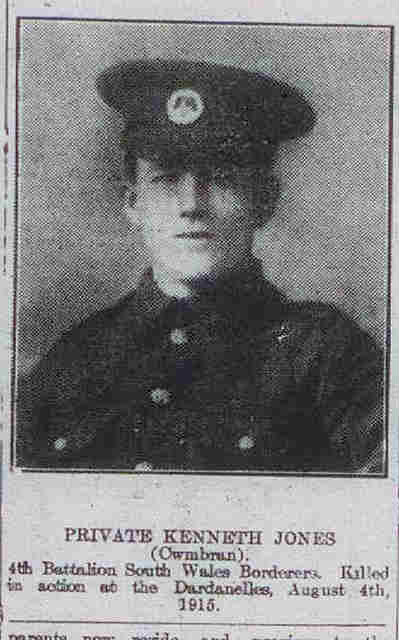 Monmouthshire Rgiment, 285060, Lance Corporal, Son of Margaret Jarrett, Oakfiel House, Ponthir, Newport, Mon., and the late George Jarrett, ARTILLERY WOOD CEMETERY, II. B. 20. Jenkins, Alfred Colin, 21, 25th October 1916, 1st/2nd Bn. Monmouthshire Regiment, 1771, Private, Son of Leyshon and Mary Jane Jenkins, of 35, Chapel St., Pontnewydd, Newport, Mon. Native of Cwmbran, Newport, BANCOURT BRITISH CEMETERY, X. B. 13. 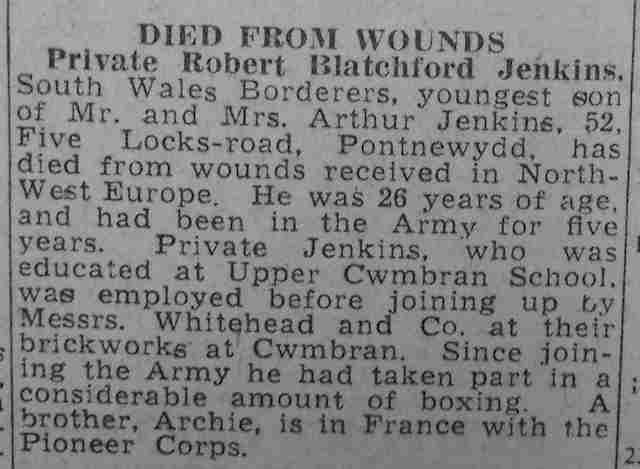 Jenkins, Robert Blatchford, 26, 7th September 1944, 3rd Bn. 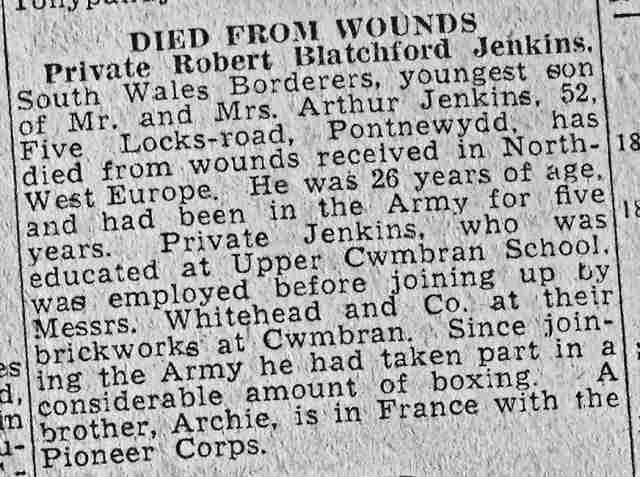 Monmouthshire Regiment, 4079809, Private, Son of Arthur and Rhoda Jenkins, of Pontnewydd, Monmouthshire, SCHOONSELHOF CEMETERY, II. D. 28. 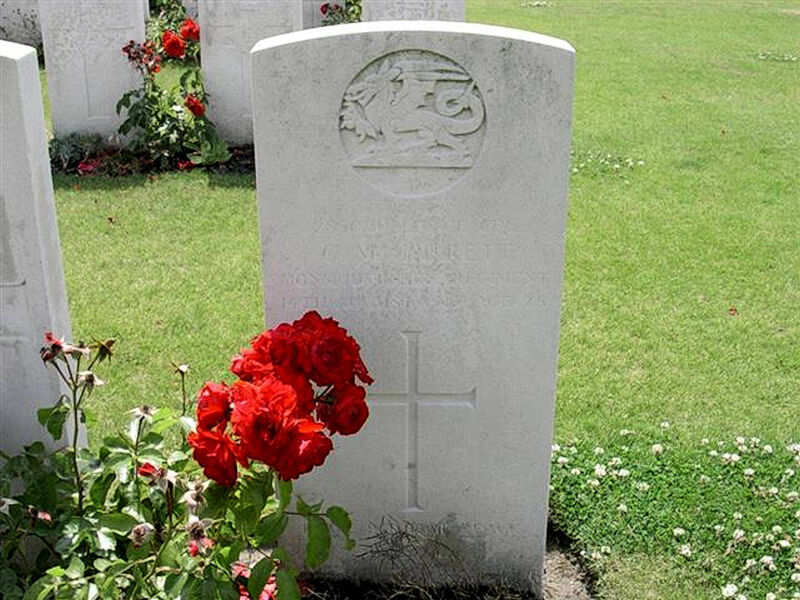 Jenkins, Sydney Oliver, 19, 3rd November 1939, 153 (Leicestershire Yeomanry) Field Regt., Royal Artillery, 322948, Trooper, Son of Sydney Arthur and Gwenllian Jenkins, of Pentire, NEWQUAY (ST. COLUMB MINOR) CE<ETERY, Cons Grave 849. John, Edwin George, 26, 18th August 1918, 2nd Bn. Monmouthshire Regiment, 265314, Private, Son of George and Harriet John, husband of Emily John, of The Wain, Llanfrechfa, Newport, Mon., PLOWGSTEERT MEMORIAL, Panel 10. Johnson, Arthur Frank, 38, 4th August 1940, Civilian War Dead, Civilian, A.R.P., SJ.A.B. 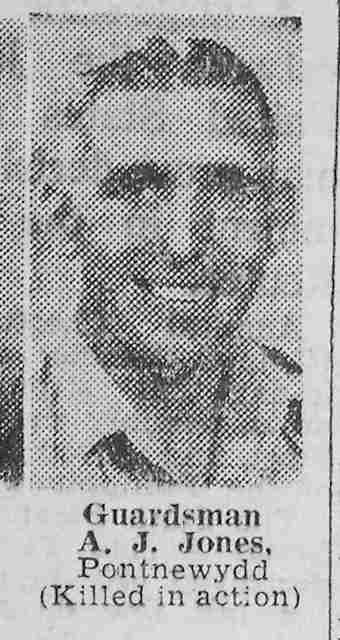 Husband of Ethel Gertrude Johnson, of Vine Tree House, Hill Top, Cwmbran. Died at Cwmbran, CWMBRAN, URBAN DISTRICT. Johnson, James, 13th August 1915, 4th Bn. South Wales Borderers, 12754, Private, ALEXANDRIA (CHATBY) MILITARY AND WAR MEMORIAL CEMETERY, J. 86. 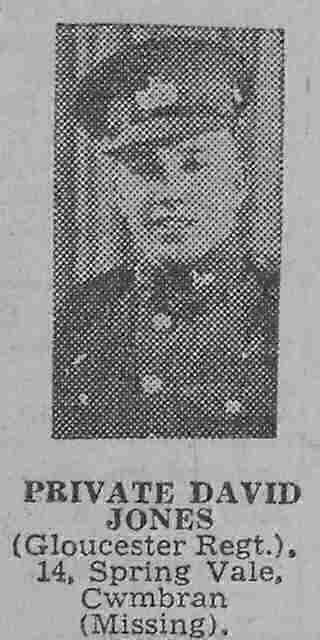 Jones, Alfred James, 31, 27th May 1944, 3rd Bn. 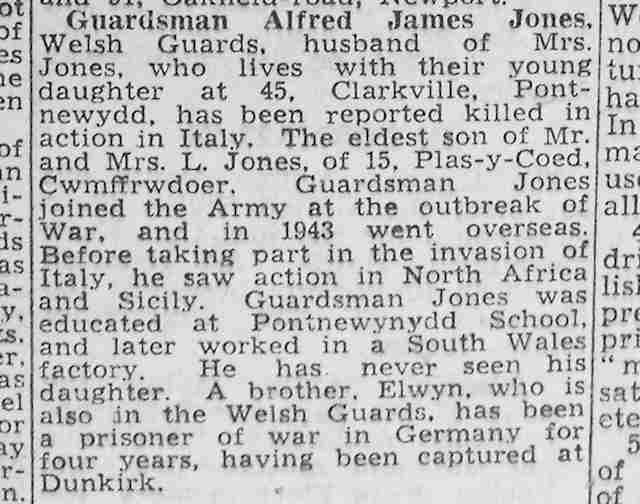 Welsh Guards, 2736969, Guardsman, Son of James and Lear Jones; husband of Sarah Jones, of Pontnewydd, Monmouthshire, CASSINO WAR CEMETERY, VII. J. 10. 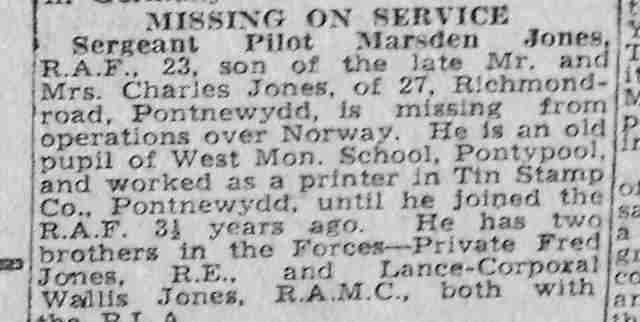 Jones, Charles, 26, 1st July 1917, 2nd Bn. Monmouthshire Regiment, 2395, Lance Corporal, Son of Mrs. Hannah Jones, of 5, Hodge Terrace, Cwmbran, Mon., THIEPVAL MEMORIAL, Pier and Face 16 B.
Jones, Christopher David, 23, 9th May 1945, 10th Gurkha Rifles attd. 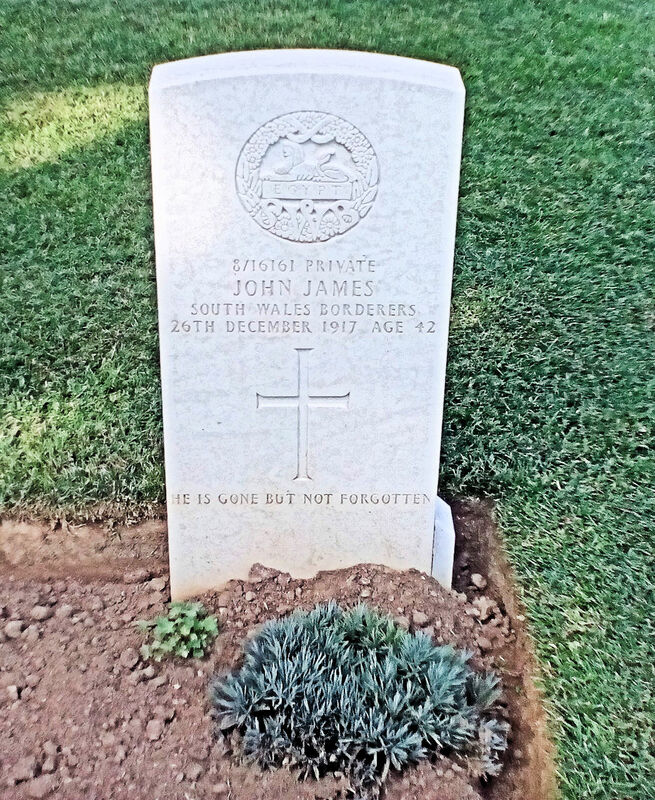 Indian Engineers, EC/13434, Captain, Son of William and Edith Rachel Jones, of Liantarnam, Newport, Monmouthshire, KANCHANABURI WAR CEMETERY, 10. O. 13. 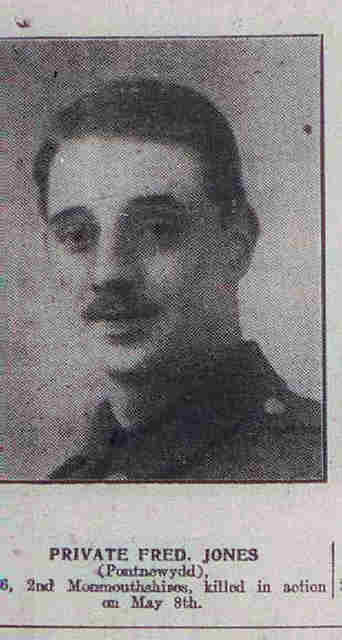 Jones, Daniel, 25, 8th May 1915, 8th Bn. Somerset Light Infantry, 44531, Private, Son of Evan and Sarah Jane Jones, of 2, River Row, Pontrhydyrun, Newport, Mon., COUIN NEW BRITIAH CEMETERY, D. 45. 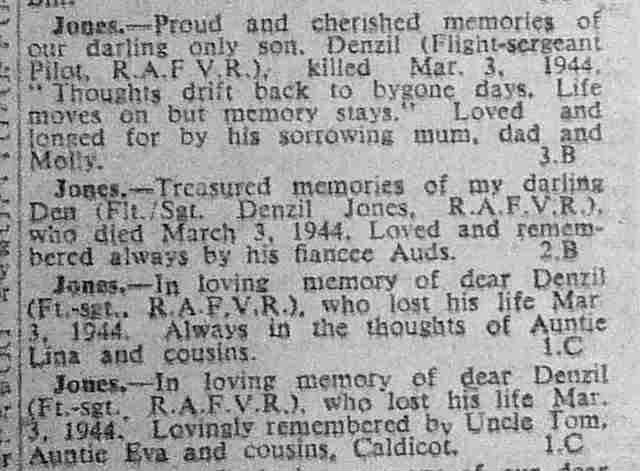 Jones, Denzil, 20, 3rd March 1944, Royal Air Force Volunteer Reserve, 640 Sqdn., 1412783, Flight Sergeant, Pilot, Son of Sidney Henry and Edith Jones, of Croesyceiliog, LLANFRECHFA (ALL SAINTS) CHURCHYARD, North side. Row 10. Grave 8. Jones, David, 20, 19th May 1940, 2nd Bn. 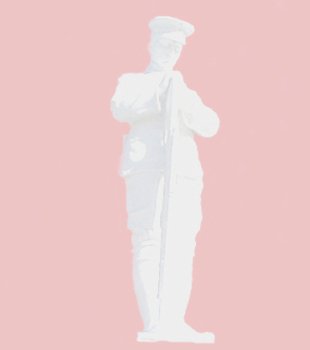 Gloucestershire Regiment, 5185332, Private, Son of George and Annie Jones, of Cwmbran, Monmouthshire, DUNKIRK MEMORIAL, Column 56. 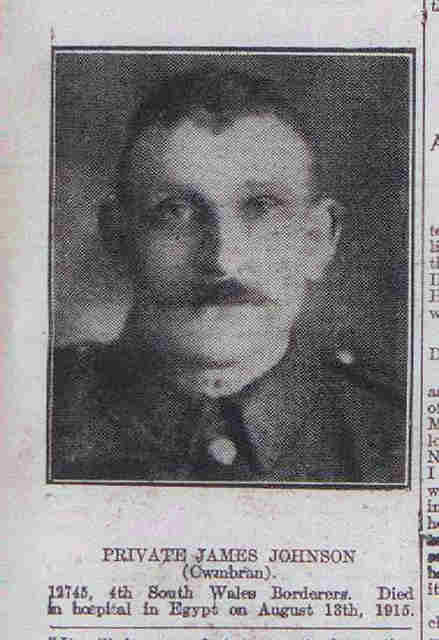 Jones, Fred, 21, 8th May 1915, 2nd Bn. Monmouthshire Regiment, 2366, Private, Son of William and Matilda Jones, of 9, Wyndham Terrace, Pontymister, Risca, YPRES (MENIN GATE) MEMORIAL, Panel 50. Jones, Rev. 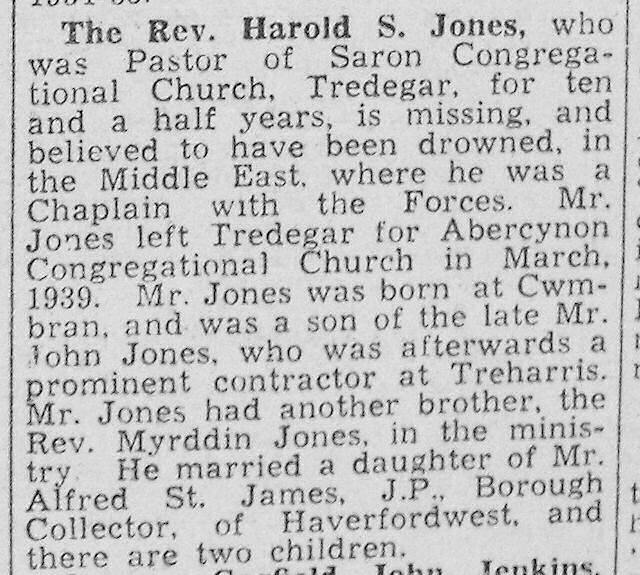 Harold S, 39, 24th April 1941, ROYAL ARMY CHAPLAINS' DEPARTMENT, 104052, Chaplain 4th Class, Son of John and Mary Jane Jones; husband of Lilian Louisa Jones, of Haverfordwest, Pembrokshire, ATHENS MEMORIAL, Face 8. Jones, James William Edward, 26, 10th June 1916, 1st Bn. Worcesterhire Regiment, 11323, Lance Serjeant, Order of St. George 2nd Class (Russia), Son of Thomas and Mary Ann Jones, of 59, Woodside Rd., Cwmbran, Newport, Mon., THIEPVAL MEMORIAL, Pier and Face 5 A and 6 C.
Jones, Kenneth, 9th August 1915, 4th Bn. South Wales Borderers, 13058, Private, HILL 60 CEMETERY, II. B. 5. Jones, Marsden, 23, 4th March 1945, Royal Air Force Volunteer Reserve, 524 Sqdn., 1506083, Flight Sergeant, RUNNYMEDE MEMORIAL, Panel 271. 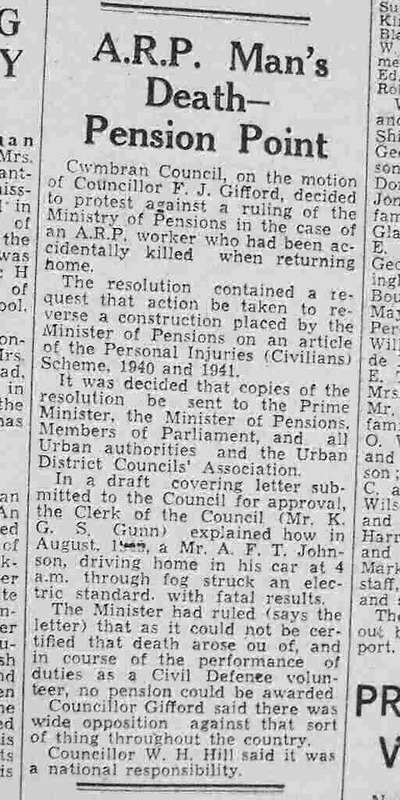 Jones, James Ronald, 23, 2nd November 1945, Royal Army Ordnance Corps, 355394, Major, Son of James Thomas Jones and Gladys Gwendoline Jones, of Llanfrechfa, Monmouthshire. King's Commendation for Brave Conduct, RANCHI WAR CEMETERY, 8. C. 2. 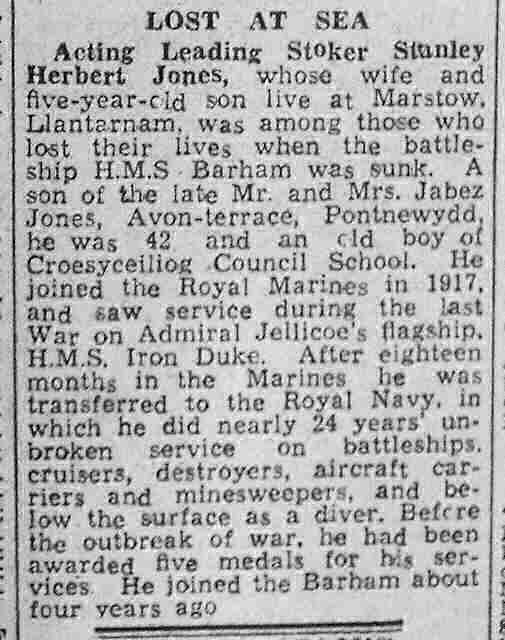 Jones, Stanley Herbert, 41, 25th November 1941, Royal Navy, H.M.S. Barham, P/K 58013, Leading Stoker, Son of Jabez and Sarah Jones; husband of Mary Lavinia Jones, of Llantarnam, Monmouthshire, PORTSMOUTH NAVAL MEMORIAL, Panel 54, Column 2. 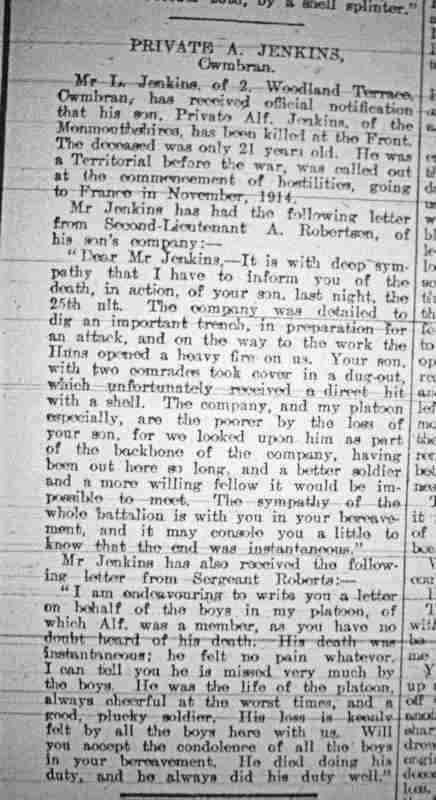 Jones, William, 25, 8th August 1915, 8th Bn. Welsh Regiment, 27254, Private, Son of Evan Jones, of 2, River Row, Pontrhydyrun, Newport, Mon., HELLES MEMORIAL, Panel 140 to 144. 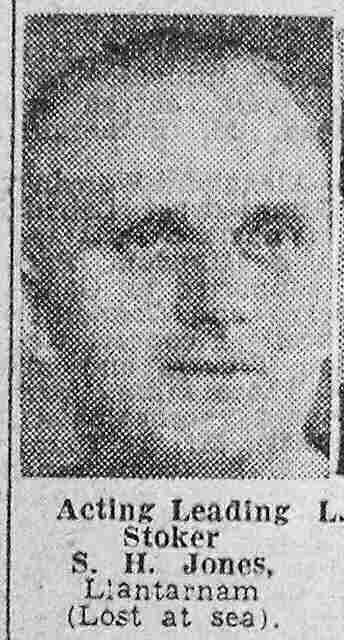 Jordan, Ernest James, 39, 19th May 1942, Royal Navy. H.M.S. Ceres, D/SS10804, Able Seaman, Son of James Henry and Helen Jordan; husband of Iris Elizabeth Sarah Jordan, of St. Margarets, Twickenham, London, England, TEHRAN WAR CEMETERY, 2. C. 1.